Who Needs Shoes? I Just Hiked the Grand Canyon Rim-to-Rim Barefoot! What I did this weekend has probably been done many times before, by people native to the area. But—as a suburbanite 53-year-old chronically injured running grandma–my hope for the writing that follows is that it will inspire others to look conventional wisdom in the eye—and run the other way, barefoot. Conventional wisdom = you will sprain your ankle, puncture your tender soles, or step in poo if you hike barefoot—at the Grand Canyon, or anywhere else. It’s dangerous and unnatural, and highly engineered hiking boots or lugged-sole running shoes are the only way to safely negotiate rocky (and poopy) trails. My experience says: that’s a load of mule sh#t! If an average middle-aged lady like me can make it safely—and more important, happily! —the 14 miles down North Kaibab and 9.8 miles up Bright Angel trails, wearing nothing on my feet, then conventional wisdom needs to join the 21st century and smell the flowering barefoot movement. 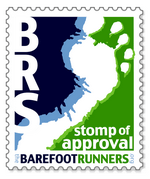 There’s lots of places on the internet where you can read all kinds of info about running, hiking, even living: barefoot. For almost three years, I’ve been doing my homework, educating myself—and more importantly—getting outside 2-4 times a week to hike and trail run barefoot in my local, fabulous hills of coastal sage scrub and chaparral. And adding my own blog-bits of experience to the giant societal brain that is the internet. 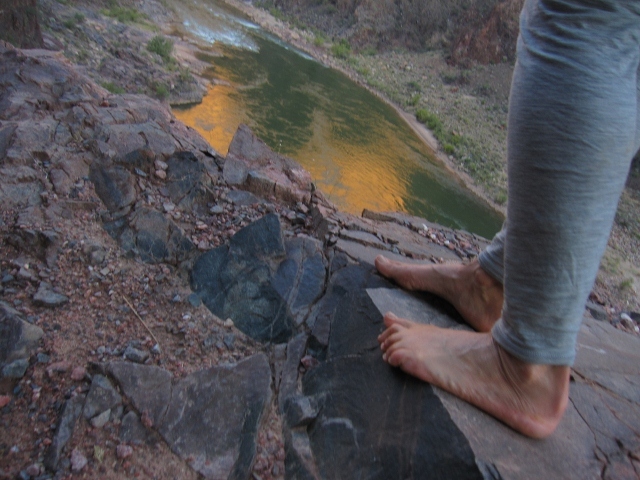 Along the way, almost sneakily, since I couldn’t tell you the exact day I had the thought, this crazy dream began to take (barefoot) shape: run and/or hike across The Canyon sans shoes. Three weeks at the North Rim in the summer of 2011 laid the groundwork. I got to know the trails of the Rim, and ventured into the Canyon a few times. Not as much as I wanted to, though, ’cause my right knee went south on the second day of my stay as I was headed down the North Kaibab Trail to the Supai Tunnel. Death of a dream? Only for someone who wasn’t raised fighting for every scrap of Jello around a small kitchen table crowded with six siblings. So I kept on with my day-to-day “escape runs” (or hikes-with-a-camera, depending on how either temperamental knee was feeling), until one day, actually it was two days ago, I woke up in the autumn dark, re-checked my little knapsack of supplies, kissed my husband goodbye, and started down the North Kaibab Trail at 6:30 am. 38 degrees. Cloudy. Was it “cheating” to have stuck to the top of my feet a packet of Grabber Stick-On Toe Warmers? (Warning on package: do not apply directly to skin.) Within a mile, one fell off. Within two miles, I had descended low enough (the Supai Tunnel) to where it was a warm 58 degrees. The needly initial stinging in my toes had long ceased (or were they just numb? ), and I was eager to tackle infamous Switchbacks below the tunnel. It was more like, The Switchbacks tackled me. Within two steep turns, my left knee began complaining, something that would continue intermittently, in varying degrees of ouch-tensity, the next 20 miles. But guess what: my knee has hurt before since its initial ruining-of-a-race back in 2004, and I was tired of letting it dictate my mood. I smiled (or maybe just bared my teeth) and kept on hiking. 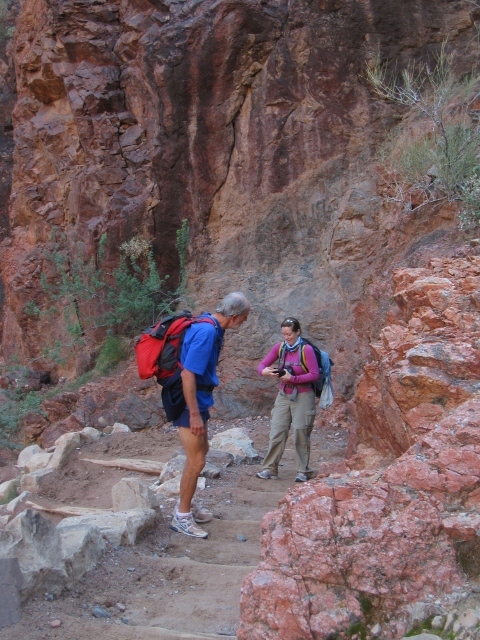 Down, down, down, 14 miles total from the North Rim to Phantom Ranch that day. Soaked by rain. I dried off pretty quick in my rain-shell parka and wooly leggings. Chilled by wind. It was only windy part of the time. If I moved faster, I was warmer. My standard reply, to this and most barefoot-related questions/comments, including the ever-popular, “Why do you do this?” . . . Drum roll . . . “It’s fun.” These two words are shorter than a sermon—that’s what this essay is for—and they really do sum it all up. It’s about enjoying the trail, even if I’m not able to run every mile. And feel what’s real: dirt and mud and rocks—my kin! I’m made of dust too . . . 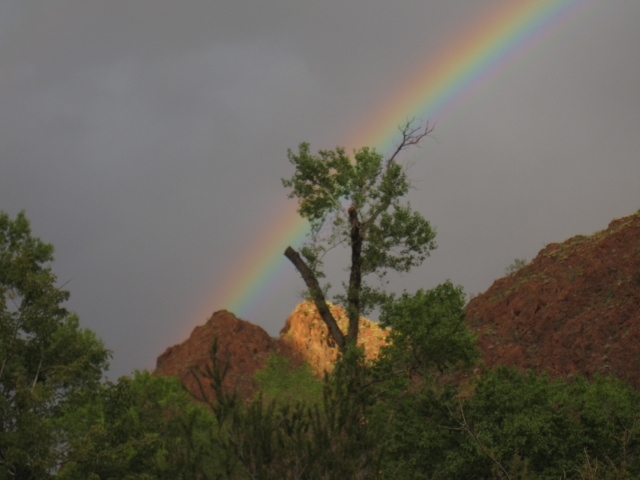 So I had a wet-footed good time on the 14-mile downhill (5,800 feet elevation loss) from the North Rim to Phantom Ranch, where it was a rainbow-perfect 60 degrees at 2 pm. A delicious dinner (I chose vegetarian stew) comes all you can eat, with crispy salad, corn bread, chocolate cake . . . mmm. Add a comfortable spot in the women’s bunkhouse, and I was ready for an early start the next morning. Saturday morning: a sickle moon in the cloudless sky seemed to point to a good day ahead. The storm system had blown past—but not before freezing the bejeebers out of my husband, who had huddled through the snowy night in our VW station wagon at the North Rim before leaving early Saturday for the 220-mile drive to pick me up at the South Rim. We had agreed to meet at noon at the Bright Angel Lodge fireplace, not knowing how long it would take me to hike out, or whether I would be on the South Kaibab or Bright Angel trail. The S. Kaibab is two miles shorter in length, but much steeper and without any available water. 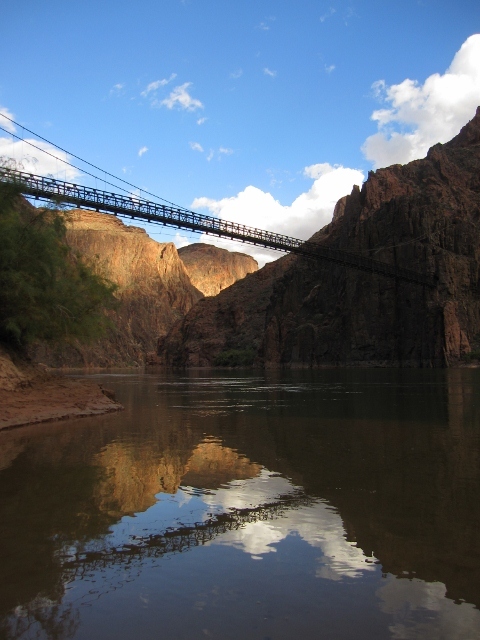 After discussion with other Phantom Ranch guests, I decided on Bright Angel, with its several water/restroom stops—and heart-achingly amazing river-and-creekside hiking up until Indian Gardens, about the half-way point. So much soft damp sandy trail for the first mile, too. It was barefoot-hiking heaven. The green river (Colorado was its pre-dammed color) frosted with rapids, the sunrise cliffs of contrasting red-gold-and-shadow, dreamy streamside vegetation smells. Sigh. Why am I not there right now . . .
Well, I was, yesterday, making my way the almost-ten-miles of Bright Angel trail up to the South Rim and all its extravagant tourist-i-ness. As I climbed the 4,400 feet that would get me from the Colorado River to the Rim, I alternated taking my fleece top on and off. With the trail mostly in shadow, and the damp ground cool to my toes, if I wasn’t striding pretty fast I would get a bit chilled. So—I aimed to make some good time. At least after Indian Garden, the half-way point. It took me all of four hours to get there—lots of loafing along, chatting with all the nice hikers, taking photos, enjoying the creek crossings by lingering a while with my feet in the water. Ahhh. But shoot—now it was 10 am, and I was supposed to be five miles away (and 3,000 feet higher) in two hours. Could I do it? Would Steve even know how to find the trailhead? (He can be a bit directionally challenged). Heck, would he even be able to find the South Rim? While he does 99 percent of the driving on our adventures, I do 100% of the navigation. I’d given him both written directions and a map—but he can be dyslexic at times . . .
At this point, my left knee was killing me, with jolts of pain flashing through it when I maneuvered it “wrong” up the many-many-many wood-or-rock steps on the trail. My hiking poles had become crutches, my new best friends. And then—somehow—thanks be to God—I discovered that if I turned my left foot out about 30 degrees, I could step a little less painfully. And then—somehow—thanks be to God—as I concentrated on motoring up the steep switchbacks at altitudes now approaching 6,000 . . . 7,000 feet—I forgot about my left knee. I fell in along John, whose pace had matched mine for the last mile, and we chatted about our teaching jobs and whether he should hike to to River tomorrow and whatnot and then we were there: the Bright Angel Trailhead at the South Rim. My inner Walter Mitty (that’s how old I am) had been imagining all kinds of cheering crowds and ticker-tape parades as I reached the top. My even-better reality: Steve had found the trailhead a half-hour earlier—had even asked some hikers if they’d seen a lady hiking barefoot. You can probably guess what they told him. Today, as I type this, I’m a bit sore. OK, I’m nearly cripple. But only when I change from not-moving to moving. Since I’d hiked to the bottom of the Canyon nine years ago (down Bright Angel, up South Kaibab), I recognize the feeling of calves-and-quadriceps in anguish. My muscles will recover; I hope to get back out on our local trails on Tuesday, teaching schedule permitting. The running will come back. It always does. The shin pain that’s bothered me for the last month seems to be subsiding. My left knee? No symptoms today. Not a hint of yesterday’s twinges. I’m 53, and feeling pretty good. I just hiked across the Grand Canyon, barefoot. More than halfway in the rain. Hey—that’s another bit of conventional wisdom blown to bits: I got my feet wet (for seven happy hours on Friday) and didn’t catch my death of cold. I did catch Rim-to-Rim fever, though. Can’t wait to try running it next time. Barefoot, of course. Here’s a few photos I shot along the way with my little pocket camera. 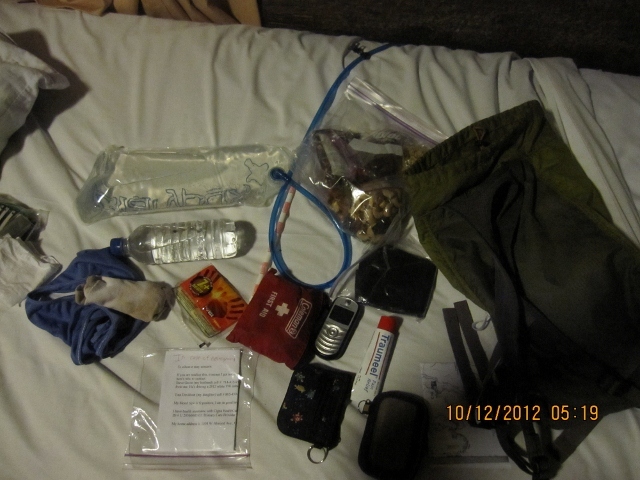 Here’s my stuff, laid out on the bed at the North Rim cabin we stayed in the night before. I’m really glad we sprung for a cabin; it was so nice to get ready in a nice warm place. The piece of paper is a note with emergency contact info. Glad I didn’t need it . 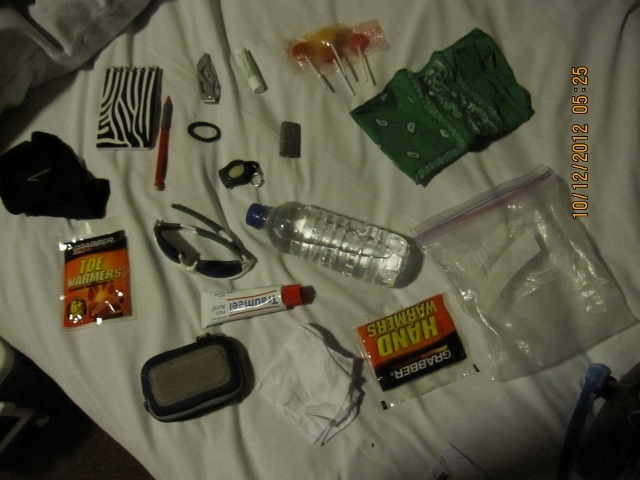 . .
More stuff I brought along. The disposable water bottle I drank at the top, then carried empty, in case I needed it for an ascent of the waterless South Kaibab trail. 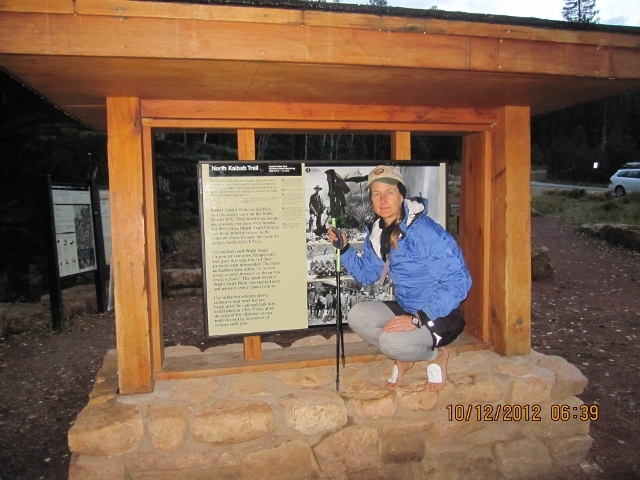 Here goes nuthin’ — Steve took this picture of me at the N. Kaibab trailhead. Pretty much all of the other shots I took–using my little tripod for the self-portraits. 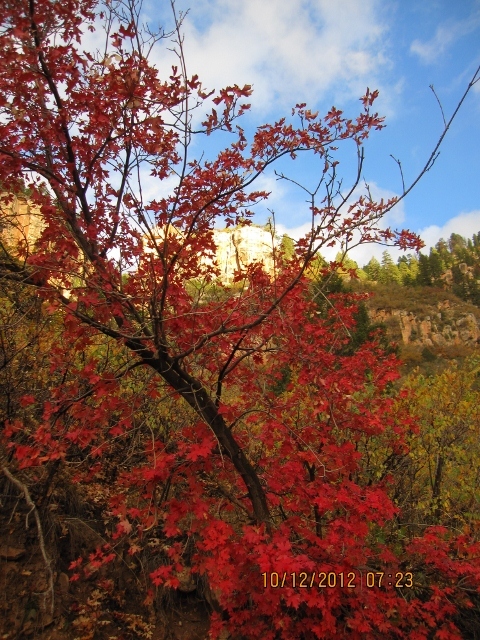 Fall color on the North Kaibab trail. Water + rocks = fun barefoot hiking along the North Kaibab trail. Yuck! Some of the bridges over Bright Angel Creek were covered in eroded asphalt. The opposite of fun . . .
Leaving my calling card along the North Kaibab Trail. 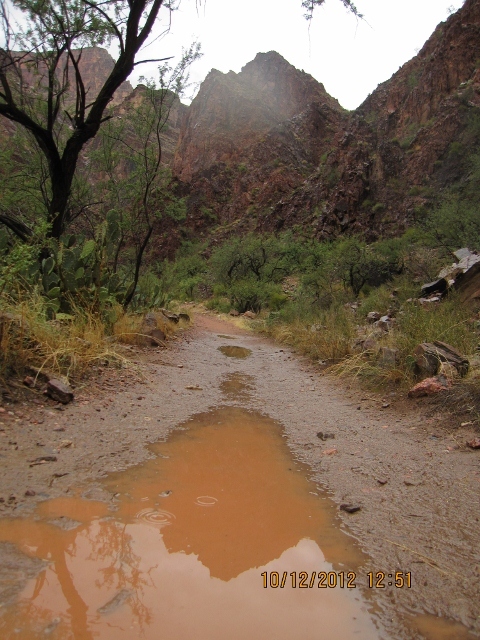 To quote the poet e e cummings: the North Kaibab trail was “mud-luscious and puddle-wonderful” on Friday. 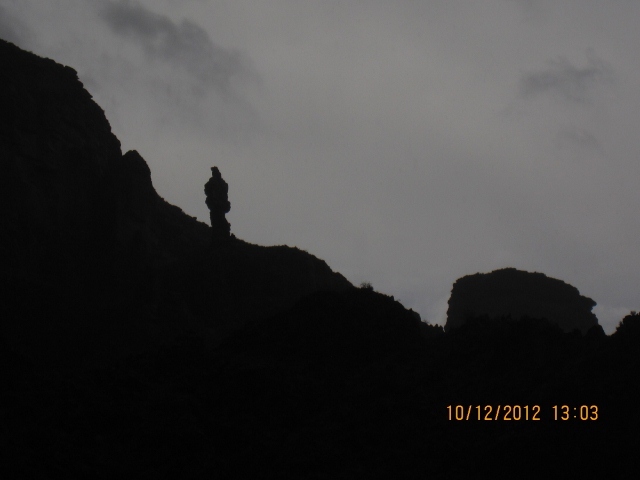 This rock silhouette reminded me of an image of Jesus carrying a lost lamb, one of the stained glass windows in our church. Yes, it was a comfort to see this on the long rainy trail . 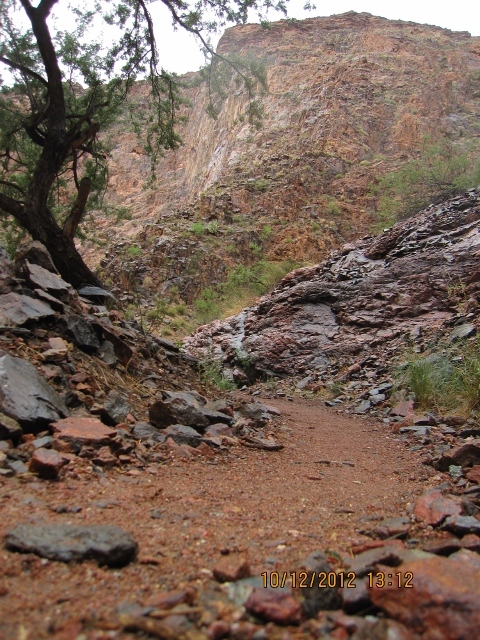 . .
Classic North Kaibab Trail conditions: damp packed sand between lots o’ rocks. 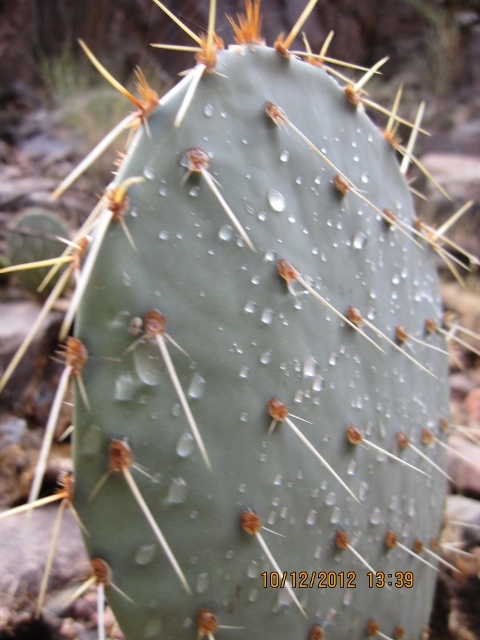 Prickly pear in between rain showers. I don’t have too many photos of it actually raining–didn’t want to get my camera wet . 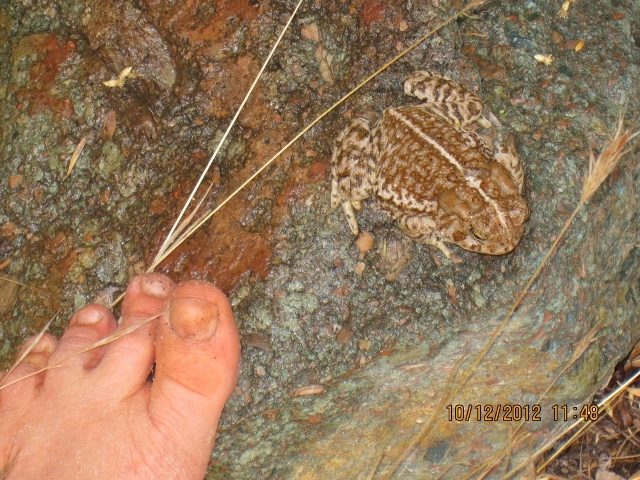 . .
After 14 miles of hiking along the wet-damp-sandy North Kaibab trail: my feet were REALLY clean! 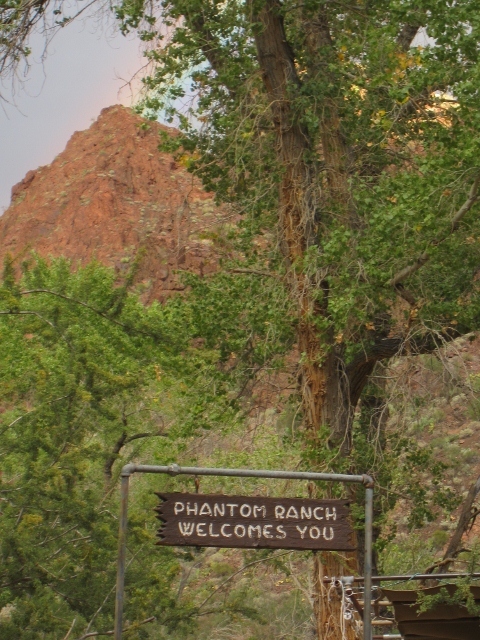 Welcome to Phantom Ranch–there’s a rainbow attached to the red peak in the background. What a welcome! The storm slowly passes over the Colorado River. That’s the Kaibab Bridge in the background. 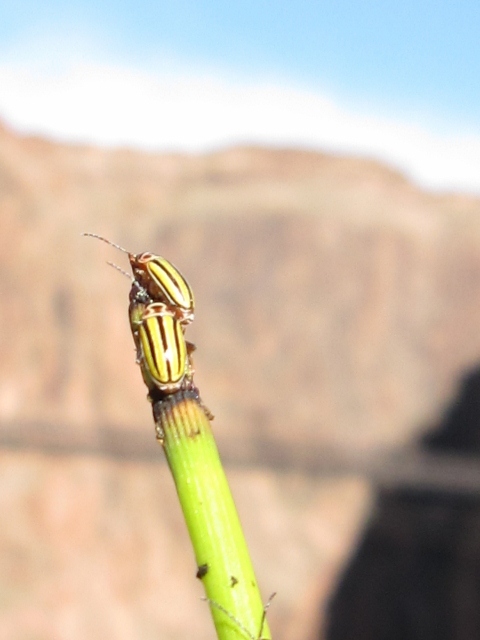 Friendly bugs on juncus (reeds) growing along the Colorado River. The Kaibab Bridge in the background again. Posing my toes by The River. 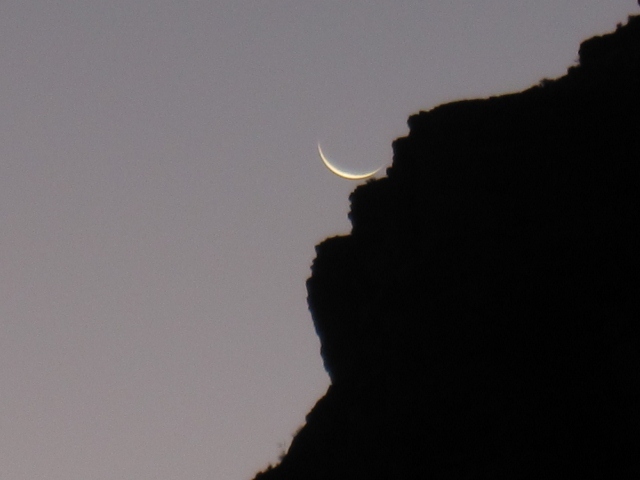 Saturday morning: clear skies and a crescent moon portend a great day of hiking. The River below reflects the glowing sunrise cliffs. The photo doesn’t show it, but I’m right on the edge for this photo–ridiculously close–I did not do that again. Lots of interesting folks along the trail–these two are working on a book . . . I won’t tell the subject, in case it’s a secret project . . . 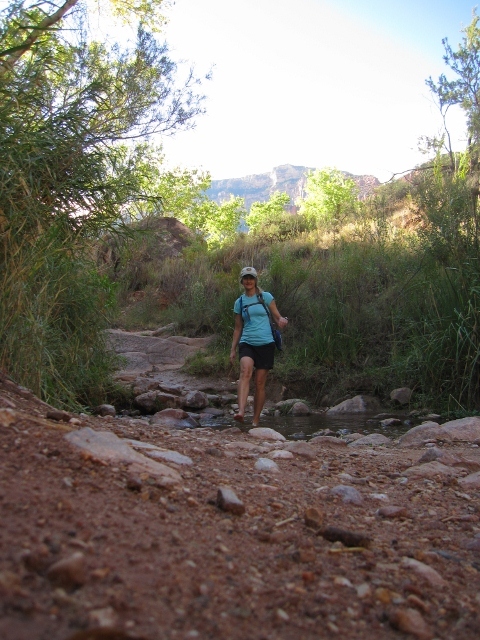 Here I am enjoying one of many creek crossings on the lower Bright Angel Trail. The day was warming up, so I had removed my fashion-forward woolies at this point. I don’t like to brag, but I was the only one I saw either day wearing running shorts with long underwear under them. Stylin’ . . .
Ta-da! With no further ado, I present: the Bright Angel Trail, trailhead. Made it! Thanks be to God! 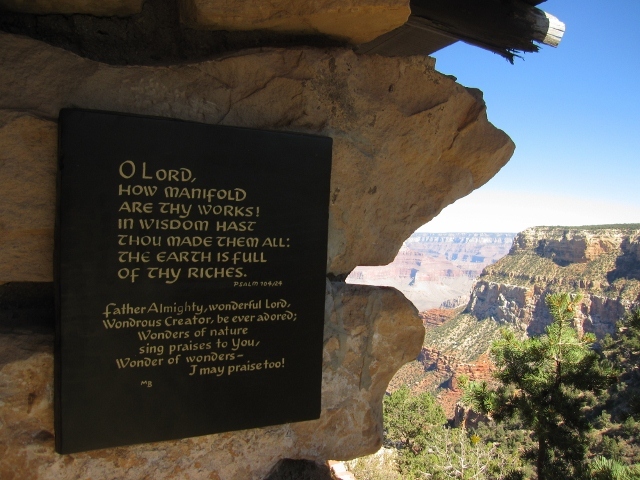 Speaking of God–how cool is it that this Bible verse appears next to the entrance to the historic Kolb Studio on the South Rim? 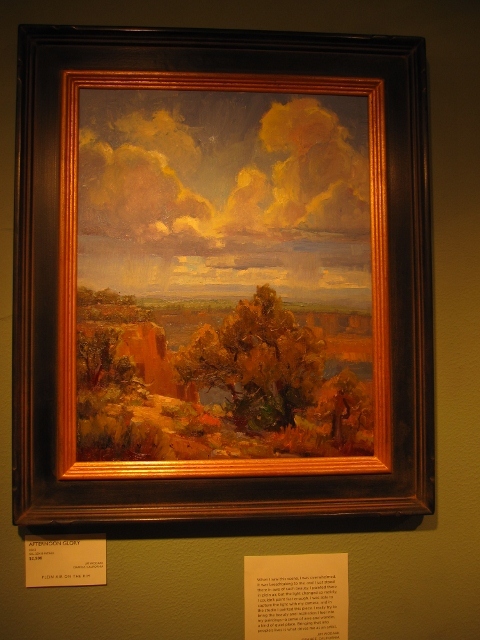 And, inside the Kolb studio, a stunning painting by one of my favorite plein air artists, Jim Wodark of Orange, CA. 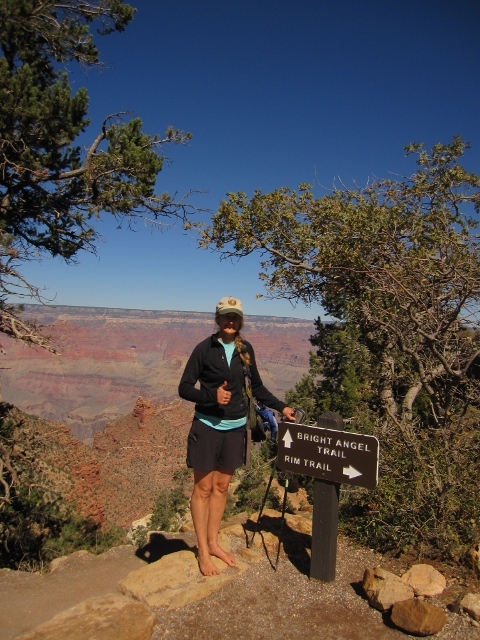 Across the Grand Canyon in 14 miles on Friday, 9.8 miles on Saturday–no shoes needed. Just my custom-made, environmentally friendly Creator Specials. I said yes to hiking the canyon rim to rim next fall for Rim2Him, a fundraiser for Revelation Wellness. Guidelines have suggested trail running shoes. I started googling if anyone has done it barefoot or in minimalist “barefoot” shoes. You inspire me. You also affirmed that I can do it in “barefoot” shoes. Thank you! My brother was one of the runners who crossed your path…I will have to ask him what his comment to you was. PS: Since you live in Orange County: Ever been to Starr Ranch? If not, you should. I think you’d truly enjoy this hidden gem, right in your own back yard. Gotta say this post made me a little weepy, mainly because it was so beautifully written and so descriptive of something I’d love to do. Inspiring, Thea. I came to your post by way of Chris’s “Barefoot Beginner” blog, and I’m sure glad I did. You have inspired me to a new goal. I intend to do as you have done by the time I’m 60 — that gives me four years. I’m new to bf running, but that seems like a pretty reasonable goal. I have just done little dance. I am glad that you linked through and found Thea’s blog. I have said so before, her writing is beautiful (Sorry Thea, I’m talking about you like you are not there). I have just clicked through to your blog, is that you pictured? Quite a transformation. I read this a little while ago but couldn’t resist putting it in with my posts this week that are all inspiring. Some great tales. hankyou. Keep up the good barefoot work on your blog! GREAT post! I would love to do this. 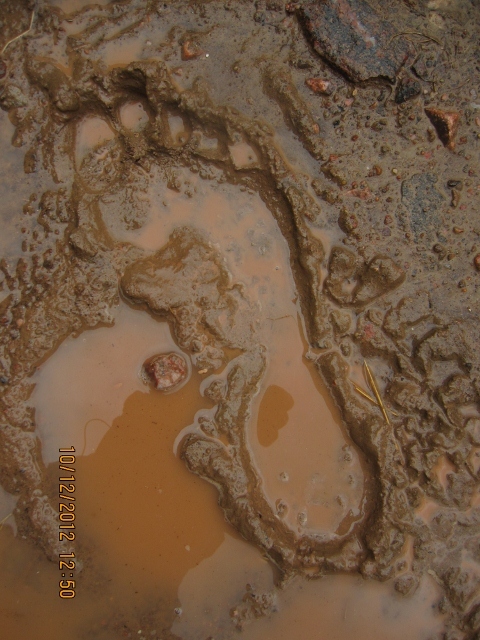 My husband and I went barefoot hiking this summer, and a guy caught up to us who was running a little faster than we were and commented that he thought there were mini sasquatches on the loose because of our footprints. We were smiling ear to ear just like you!